Seascape by good-listed British painter Edward Henry Eugene Fletcher (1851 Hammersmith (London) - 1945 Sussex). His childhood broke he in Bengalia, lived later in London, after his marriage in Blackhealth, where he was owner of a auction house. Studied: Chelsea Art School, London. 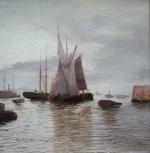 After a serious illness, around 1891, he completely turned to the painting of port and river scenes (Shipping on the Thames, Thames Estuary, both signed, 1990 in the art trade). Literature: Art lexicon by Saur (in German); Brook-Hart, 1974; Brewington, 1982 (s.v. Hayes, John, *1857); Archibald, 1989. 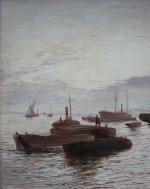 Measurements: unframed w 30 1/3" h 20 1/4" (77 x 51,5 cm); framed w 38 3/4" x h 28 3/4" (98,5 x 73 cm). Condition: in good condition, slightly cracked, relining of original canvas.